The Carefree Way: Gem Car gets a lift? Okay, the golf cart lifting craze we sort of get, but a Gem Car? 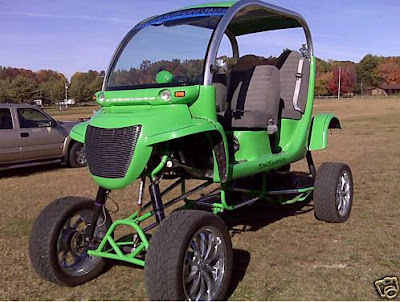 For those unaware, the Gem Car is an electric car that's sort of golf cart sized but actually comes with a title and can be legally registered for road use in many states, but only on roads with a speed limit of 35MPH or less. The creator of this little beast replaced the electric drivetrain with his own custom gas powered unit. We're not really sure why, especially since his asking price isn't that much more than what a used Gem Car in running condition goes for now. Another eBay "gem" found here.